An ambitious seminar series began last week with a discussion of a remarkable documentary. Filmed in a pioneering hospice, The Time to Die addresses a subject that remains taboo for many. Joining the conversation are health professionals, medical students and members of the public, as well as those interested in film and ethics. The series continues on 9 November 2016. The film and discussion helped me to realise that what patients and their families may need most is not a doctor but another human being to simply be there with them. Toast is burning in one of the ward kitchens at St Christopher’s Hospice in south London. Members of the nursing staff rush to open the windows, laughing at this minor disaster. In a room down the corridor a young man called Kevin is confronting a future in which he will play no part. He’s married with two young children – and has terminal cancer. Imagining his boys growing up without him is more painful than the disease destroying him. Kevin and his wife have accepted that he will soon be gone: she wants him to die at home but he doesn’t want to frighten his sons. These are just two of the moments captured in The Time to Die a documentary made in the 1990s by Nikki Stockley. Commissioned by the BBC, the film addresses a subject that remains taboo for many of us: death. Stockley focuses on three people whose lives are ending. They and those they love share their feelings. Doris hopes she won’t linger: she doesn’t want to die “inch by inch”. Hazel has lost interest in clothes and no longer looks in the mirror. She has told the hospice staff that she wants to die at home. Her boyfriend fears he would not cope; often he feels like running away. Earlier this year, academics from three different disciplines (Emma Wilson, Professor of French Literature and the Visual Arts, Dr Stephen Barclay, Senior Lecturer in General Practice and Palliative Care, and Dr Robbie Duschinsky, Lecturer in Social Sciences) sat down to plan a seminar series that would encourage a broad dialogue about care and dying, using the medium of film as a framework. Wilson, who has a specialist interest in film, proposed that The Time to Die would make a powerful starting point. The first of five seminars planned for the current academic year took place last week. Revd Dr Derek J Fraser, lead chaplain at Addenbrooke’s Hospital, talked about the role of his team in supporting patients and those close to them. A screening of The Time to Die was followed by a Q and A. Stockley took questions from an audience who included health professionals, members of the public, counsellors and representatives from local hospices. The making of a documentary about so sensitive a topic prompted questions about the relationships involved and the editing process. Stockley spent four weeks filming at St Christopher’s. The Time to Die is, perhaps most importantly, a tribute to those it features, the patients and staff of a hospice acknowledged to be a pioneer in end-of-life care. She spoke of the closeness that developed between her team and the people they filmed – and her own emotional response. “I needed to remind myself that my sadness was nothing compared to those I was filming.” She also talked about the difficulty of negotiating a commission to make a film looking at death. Junior doctors can expect to deal with as many as 40 to 50 deaths a year in the course of their work. Yet most people, in a society that protects itself from the reality of human frailty and mortality, have never witnessed death close up. Stockley suggested that film could offer a “safe way” of exploring some of the things we ask ourselves (how do people die, what’s it like to die) but seldom give voice to. Even the staff at St Christopher’s seldom talk about their own deaths. Medical statisticians have their devised their own code for death – they call it 'negative patient outcome'. If The Time to Die is brave, it is also deeply respectful – and quite rightly so. Film, certainly not one made for general viewing, cannot convey the emotional rawness of death. Death has a smell. It can be messy and protracted. It’s exhausting and deeply sad. Death affects the professionals involved as well as patients and their loved ones. At one point in the documentary, a nurse is overcome by emotion and fights back tears. How do we negotiate the line between personal and professional? Several Cambridge University medical students attended the seminar. Chris Kassam said: “Working with patients at the end of life can leave you feeling overwhelmed by the magnitude of the experience, and the easy option is to withdraw behind a mask of professionalism. I think the film and discussion helped me to realise that what patients and their families may need most at such times is not a doctor but another human being to simply be there with them." Health care assistants are among the front line staff who get to know patients best. Aiden Ferguson, a healthcare assistant at Addenbrooke's, said the documentary demonstrated that "professionalism is not nearly enough". He commented: "The film crystallises the importance of connecting with others in a way that is deeply present and true - and these connections can be forged with patients who have a terminal diagnosis and those who do not, with friends and family, with someone unknown." Doctors like to fix things: they train in medicine because they like solving problems and want to make people better. In his introduction, Barclay suggested that this impulse is at the root of the profession’s difficulties with handling death and bereavement. We don’t know when or how we will die: death is one of the life processes that defies organisation. But with careful planning, an acknowledgment of our wishes and the support of skilled professionals and loving family and friends, there is much we can do. The Time to Die shows no happy endings but demonstrates how much caring means. Kevin dies at St Christopher’s, as he had wanted, with his wife with him. Hazel dies at home, quietly and gently in her boyfriend’s arms. Standing in a rainswept churchyard after Hazel’s funeral, he is quietly proud. The seminar series continues on Wednesday, 9 November 2016 with guest speakers Professor Bee Wee, NHS England's National Clinical Director for End of Life Care and Dr Anna Elsner, University of Zurich. Professor Wee will discuss developments in national policy and practice in palliative and end of life care since the withdrawal of the Liverpool Care Pathway for the Dying. Dr Elsner will discuss a documentary exploring end-of-life care in Switzerland, 'Die weisse Arche'/'The white ark' (2015) and the Ars Moriendi (arts of dying) tradition. All welcome, no charge, booking required. 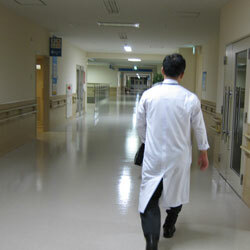 Inset image: Physician; credit: Yuya Tamai.